The Work Office (TWO) is a multidisciplinary art project disguised as an employment agency. Informed by the Works Progress Administration (WPA) of the Great Depression in the 1930s, TWO is a gesture to "make work" for visual and performing artists, writers, and others by giving them simple, idea-based assignments to explore, document, or improve daily life in New York. From a temporary central office at BRAC as part of the Shifting Communities exhibition series, TWO's administrators Naomi Miller and Katarina Jerinic interview, register, and hire employees; assign, collect, and exhibit work; and distribute Depression-era wages of $23.50 to employees during weekly Payday Parties. 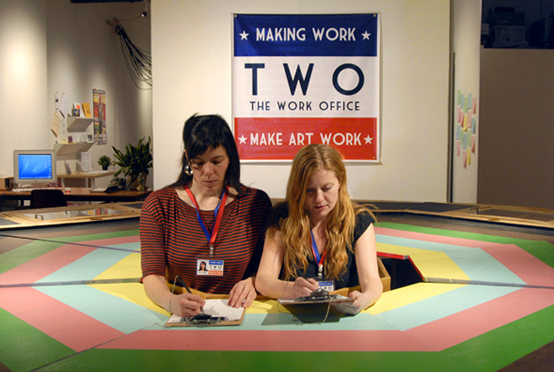 The Work Office (TWO) is part of the Shifting Communities exhibition series at the Bronx River Art Center (BRAC). Assignments will be on view during gallery hours from February 11 - 18, 2012.